Childhood onset MS has some unique features compared to adult onset MS. Firstly, it tends to be more active than adult onset MS with a greater number of relapses and more MRI activity, but equally has better reparative capacity and a later onset of progressive disease. But this is as far as the dis-similarities go. If it walks like a duck and quacks like a duck, I call that bird a duck! In a two year study of 37 paediatric MS, Bartels et al. 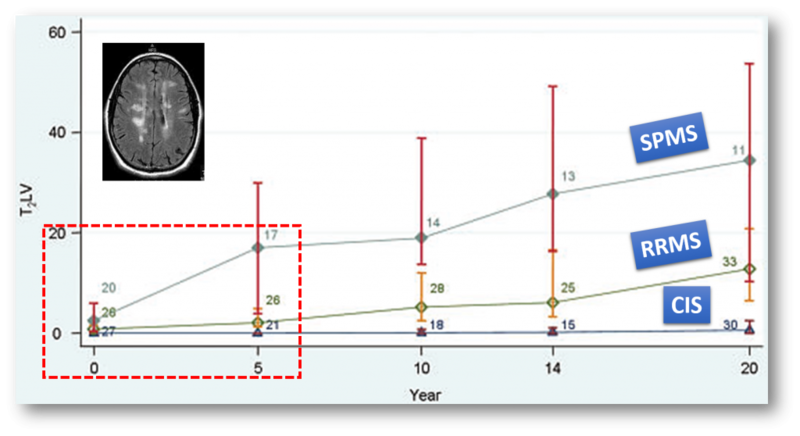 recently found that paeds cases had smaller brain volumes at first presentation, and follow-up scans revealed persistent brain volume loss (see figure below). Moreover the brain volume loss appears to correlate with relapses, i.e. disease severity. Failure of brain growth over 2-year follow-up. 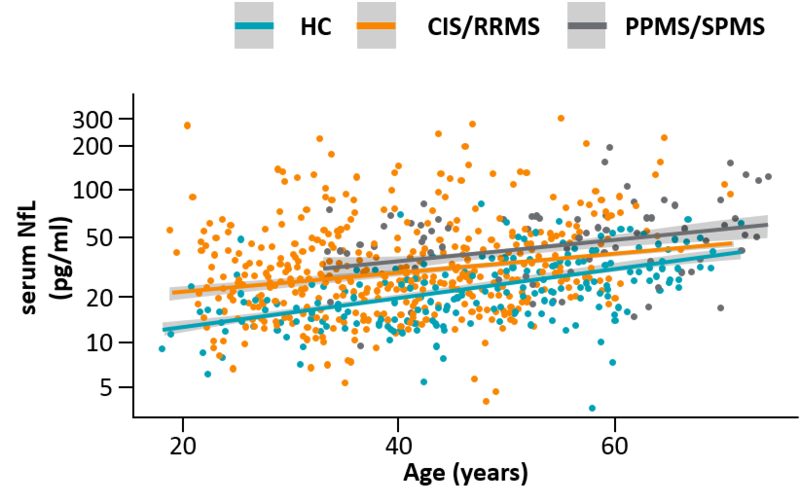 Mean brain volume z-scores at onset (first clinical presentation) and at follow-up after 2 years (mean ± SEM). Whole brain volume and white matter volume z-scores show significant reduction over 2 years, indicating accelerated brain volume loss in MS patients compared to healthy controls. Accordingly, patients show a significant increase in ventricular CSF volume (vCSF) z-scores over 2 years: (a) whole brain volume, (b) white matter volume, (c) grey matter volume, (d) peripheral grey matter volume, and (e) ventricular CSF volume. If we look at adult MS we find the same; firstly brain volume loss is present at all stages of MS, be it CIS, RRMS, SPMS or PPMS, and secondly, the early clinical features matter (see figure below). So what we’re observing in MS, regardless of onset is that it’s a disorder of pathological ageing. If you’re not convinced have a look at the figure below, the neurofilament release in the various sub-types of MS captures this beautifully (see figure below). Accelerated ageing in MS as reflected by axonal loss (Disanto et al. Ann Neurol 2017). Bartels F, Nobis K, Cooper G, Wendel E, Cleaveland R, Bajer-Kornek B, Blaschek A, Schimmel M, Blankenburg M, Baumann M, Karenfort M, Finke C, Rostásy K.
BACKGROUND: Paediatric multiple sclerosis (pedMS) patients at a single site were shown to have reduced brain volumes and failure of age-expected brain growth compared to healthy controls. However, the precise time of onset of brain volume loss remains unclear. OBJECTIVE: To longitudinally study brain volumes in a multi-centre European cohort at first presentation and after 2 years. METHODS: Brain volumes of high-resolution magnetic resonance imaging (MRI) data from 37 pedMS patients at first presentation prior to steroid therapy and at 2-year follow-up ( n = 21) were compared to matched longitudinal MRI data from the NIH Paediatric MRI Data Repository. RESULTS: Patients showed significantly reduced whole brain, grey and white matter and increased ventricular volumes at initial presentation and at follow-up compared to controls. Over 2 years, patients exhibited significant reduction of whole brain and white matter volumes, accompanied by increased ventricular volume. Brain volume loss at follow-up correlated with a higher number of infratentorial lesions, relapses and an increased Expanded Disability Status Scale (EDSS) score. CONCLUSIONS: In pedMS patients, brain volume loss is present already at first clinical presentation and accelerated over 2 years. Increased disease activity is associated with more severe brain volume loss. MRI brain volume change might serve as an outcome parameter in future prospective pedMS studies. had simultaneously appearing gadolinium-enhancing lesions. control and functional improvement in a majority of patients. this procedure be performed at experienced centers only. What does this mean in layman’s terms (the pathological ageing bit)? It sounds bad. My arrogant neuro told me that I had taken the diagnosis badly. Given the quote above, I believe I was right. Hi Kevin, the brain losses volume as you age. It normally occurs at a rate of 0.1-0.3% per year. This is because the Bain is losing neurones (neurofilament release in the CSF with ageing captures a bulk of this, you can see this in the figure above). With MS this occurs at a faster rate, and PwMS reach the ageing milestones faster because of the brain volume loss. As you can see in the neurofilament graph those with progressive disease (PPMS/SPMS) are at greater risk of more neuronal loss (ie have greater neurofilament loss) at the same ages compared to controls. That is what I mean by pathological ageing. The new bit is the possibility that if it occurs early on (ie in childhood) then you may even be dealing with failure of brain growth.